“Die, you son of a whore!! Die! !” shouted Israeli men at a seriously wounded Palestinian child, who was left to die while police stood around him doing nothing. One of the officers repeatedly pushed the boy down with his foot, whenever he tried to sit up. The officers did not shoot him, but left him bleeding with head injuries, broken legs and other serious injuries on the ground. The boy was able to raise his head a few times, but the police officers kicked him back down until he bled to death. The slain Palestinian child has been identified as Hasan Khaled Manasra, 15 years of age, while his cousin Ahmad Saleh Manasra, 13, suffered a serious injury. They are both from Beit Hanina, in Jerusalem. The incident took place near Pisgat Zeev Israeli settlement, in occupied Jerusalem. The police claimed that the boys stabbed two settlers, wounding them. A settler who chased the boys with his car also rammed Ahmad. But the police presented no evidence to connect the two children with the crime that they claimed the boys committed. 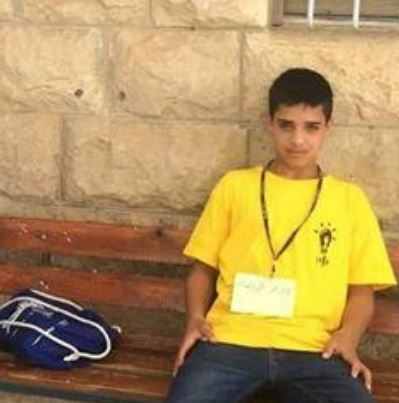 Palestinian Presidency spokesperson, Nabil Abu Rodeina, said the execution of the child is an ugly Israeli crime committed by Israel in violation of every legal and humanitarian law, and demanded the apprehension of those responsible for his death. Since October 1st, when two Israelis were killed in a ‘lone wolf’ attack by a Palestinian in Jerusalem, 26 Palestinians have been killed, including a pregnant woman and her two-year old child killed in an Israeli bombing on Sunday morning. Over 1200 Palestinians have been injured, many of them hit by live ammunition fired by Israeli troops at Palestinian demonstrators armed only with stones. During that time period, no Israelis have been killed beyond the two who died in the October 1st attack, but six have been wounded in alleged attacks by Palestinians. No Palestinian faction has claimed responsibility for any attack, and it appears that the Palestinians who wounded Israelis were acting on their own. In addition, Israeli authorities have been revealed on several occasions to have lied about the Palestinians they have killed – claiming falsely that the Palestinians had been attempting to stab or attack Israelis, but eyewitness and video evidence disproved this claim in a number of cases. This entry was posted in Children, Civil Rights, Fascist, Freedom fighters, Human Rights, Israel, Justice, Palestine, Protests, Rights, war and tagged American foreign policy, British foreign policy, Canada, ethics, imperialism, Israel, lies, mainstream media, Palestine, Propaganda. Bookmark the permalink. ← Canada: The Cover-Up and Theft of Another Election.